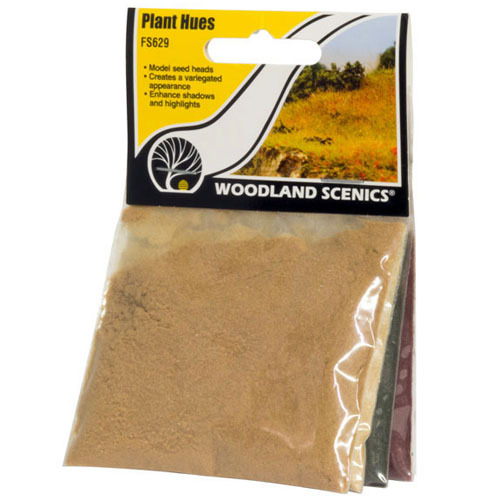 Plant Hues (4 Colors) - NEW Woodland Scenic's Plant Hues model the appearance of seed heads and create a subtle, variegated appearance for realistic fields and meadows. Use Plant Hues to emphasize contours with highlights and shadows. Includes 4 colors: Golden, Wheat, Shadow Green and Red Switch. 4mm Autumn Rust-White-Purple Blossom "SILFLORETTES"! Approximately (50) 4mm tufts placed in a nonsymmetrical pattern on a 1-1/2" x 12" long sheet. Autumn Blossoms contain white to violet flowers transitioning to brownish/tan tufts. 6mm Spring Yellow-White Blossom "SILFLORETTES"! Approximately (50) 6mm tufts placed in a nonsymmetrical pattern on a 1-1/2" x 12" long sheet. Spring Blossoms contain bright yellow tufts that mix and transition to all white tufts. 6mm Summer Red-White Blossom "SILFLORETTES"! Approximately (50) 6mm tufts placed in a nonsymmetrical pattern on a 1-1/2" x 12" long sheet.Summer Blossoms contain bright red tufts that mix and transition to all white tufts. 6mm Late Summer Violet-White Blossom "SILFLORETTES"! - Approximately (50) 6mm tufts placed in a nonsymmetrical pattern on a 1-1/2" x 12" long sheet. 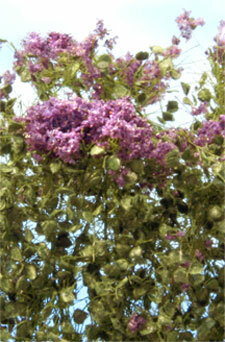 Late Summer Blossoms contain purple tufts that mix and transition to all white tufts. 6mm Autumn Rust-White- Violet "SILFLORETTES"!Approximately (50) 6mm tufts placed in a nonsymmetrical pattern on a 1-1/2" x 12" long sheet. Autumn Blossoms contain brownish/tan tuft flowers transitioning to violet then white flower tufts. Bright white flowers on delicate green leaf flake foliage. Each 7" long piece contains approximately 30-35 flowers that you snip, bend and plant! Yellow Buttercups - Canary yellow flowers on delicate green leaf flake foliage. Each 7" long piece contains approximately 30-35 flowers that you snip, bend and plant! Geranium Flowers - Deep red orange flowers on delicate green leaf flake foliage. Each 7" long piece contains approximately 30-35 flowers that you snip, bend and plant! Purple Heather Flowers - Deep voilet flowers on delicate green leaf flake foliage. Each 7" long piece contains approximately 30-35 flowers that you snip, bend and plant! Orange Marigold Flowers - Orange fall flowers on delicate green leaf flake foliage. Each 7" long piece contains approximately 30-35 flowers that you snip, bend and plant! Red Petunia Flowers - Deep red flowers on delicate green leaf flake foliage. Each 7" long piece contains approximately 30-35 flowers that you snip, bend and plant! Summer Lupines - Sample - 1½" x 1½" swatch! Flower Garden Assortment Pack - Make your flower garden the envy of the neighborhood. This complete set features all six flowers! 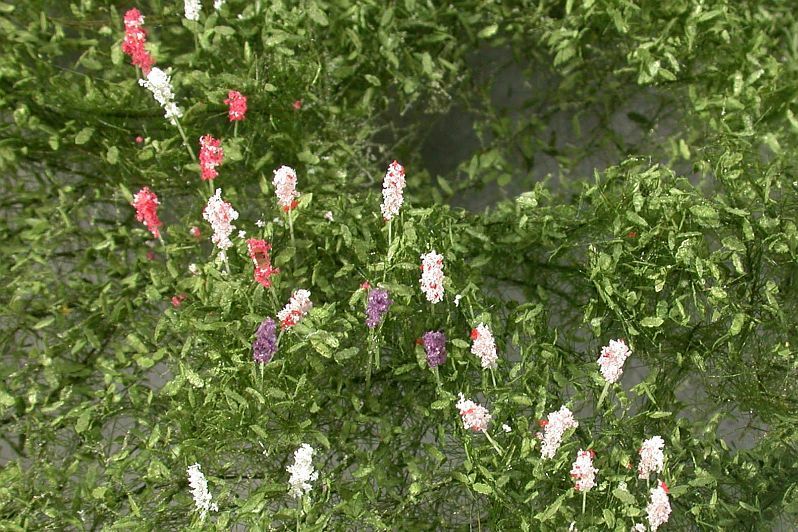 Each strip measures approximately 7" long and contains approximately 30-35 flowers per strip. Easy to use!